The perfect treat for someone special to sail deep underground and through the veil of a magical waterfall back to a time of myth and legend. Set back in the mists of time, ancient Welsh tales unfold with dramatic scenes, light and sound. Our Gift Vouchers provide an exciting chance to sail through a magical waterfall and into an ancient world of myths and legends. They are available for adults, children and seniors and valid for 12 months from the date of purchase. The recipient simply contacts us to book their underground sailing for their chosen date and time date and time. 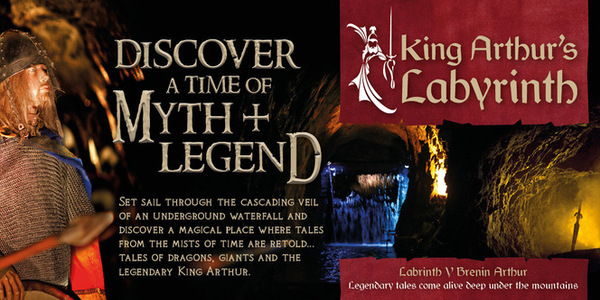 Underground boats will sail into King Arthur's Labyrinth from 1st April to 3rd November 2019.